The Still Doin’ It Site is being redesigned! Posted in: Still Doin' It. He’s lately been making waves internationally with his dubstep work as DJG, but tonight Genome returns to his drum & bass roots with a bag full of classic tunes. Not to be missed! Method One and oldschool records. Considering the size of his collection, that is pretty much all that needs to be said. Expect the unexpected! Smooth atmospheric classics are the order of the day here, with SDI resident Kuze going toe-to-toe with David Gropper. Wicked! Still Doin’ It is proud to announce the San Francisco return of a pair of drum & bass legends: the incomparable LTJ Bukem and MC Conrad. Bukem shows always go off large in the Bay Area, so do we really need to seell this show to you? You should be there, and that’s that. But for those of you who have spent the last decade in a cave and need a little more convincing, know this: when it comes to the blissed-out, smooth sounds of drum & bass, no one on this planet has left a bigger mark than Bukem and his label Good Looking Recordings. 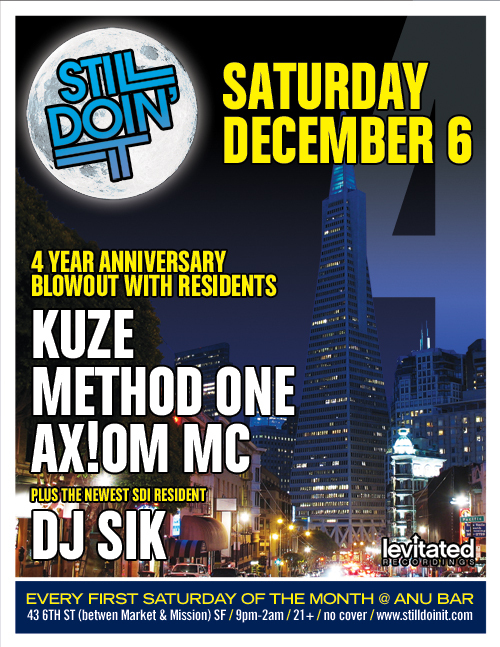 Joining Bukem and Conrad on the night are your SDI favorites Kuze, Method One, Ax!om MC and MC Child. Be sure to get there early, because this show is sure to fill up fast. Full info below. Still Doin’ It is proud to host the afterparty for the BADNB (Bay Area Drum & Bass) Lovefest 2008 float! Immediately following the Lovefest festival at City Hall, join us a few blocks away for a special showcase of top Bay Area drum & bass talent. On the dj front, we have Bachelors of Science (Horizons Music), Method One and Kuze (Still Doin’ It), 2 Cents (Compression), Canadub (BADNB), The Heights (Life Recordings) and Glyph (In2It). 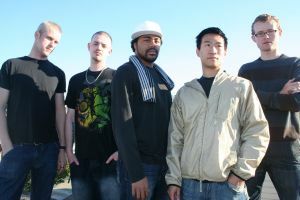 And now for the microphone talent: MC Duh, Colonel MC, Ax!om and Manny Vibes will be commanding the rhymeflow. This is a special extended event, and we will be charging $5 at the door for entry. Doors open at 8:30pm. September is debut month here at STILL DOIN IT, with first-time sets from two of San Francisco’s hardest-working drum & bass djs. DJ SIK will be bringing in his amazing skills honed by years behind the desks of Santa Cruz’s “Metallic Blurp” radio show. Expect the unexpected with Sik, as he has the ability to mix in a forgotten favorite or oldschool classic in at a moment’s notice. As a resident of Shelter (Tuesdays @ Underground SF), CANADUB is ready to take the dancefloor on a smooth liquid journey, and will surely make people very happy at Anu! Plus, you have residents KUZE, METHOD ONE, AX!OM MC and MC CHILD rounding out what will surely be a wicked evening. In addition, this event will be an official fundraiser for the BADNB (Bay Area Drum & Bass) float in this years Love Fest Parade. Donations will be taken at the door. August’s edition of STILL DOIN’ IT is almost here, and we have something very special planned. Come join us for a Covert Operations/Levitated Recordings showcase featuring the legendary producer ASC. With current and upcoming releases on numerous labels (including Covert Operations, Horizons Music, Vibez, Vampire, Offshore, Outsider, Red Mist, Warm Communications and more), ASC’s unique production skills have made him highly in-demand worldwide. Joining ASC behind the decks are your SDI residents METHOD ONE and KUZE, with MC CHILD and AX!OM MC handling mic duties.Plus, Levitated Recordings and Covert Operations will be providing free music and apparel giveaways all night long!Don’t miss out on this special night…and, like every STILL DOIN IT, there is no cover charge! After three-and-a-half years as one of the main forces behind Still Doin’ It, the inimitable DJ M is moving on to new things…but before he goes, he will be delivering a smashing SDI set! Best of luck to you, Dave! Still Doin’ It returns on June 6 for a fast-paced drum & bass brawl…well, considering the smooth sounds that will be thrown down, “brawl” isn’t exactly the appropriate term. But read on! First off, we welcome back one of our favorite out-of-town guests, Stunna from Chicago. He straight destroyed the dancefloor last time he was here, and this time around he will be paired with the newest SDI resident Method One. That in itself would be a rocking night at Anu, but there’s more! Former SDI resident Retox returns alongside the almighty Kuze for some serious bouncy business and soulful vibes. On the mic, we have the duo of Ax!om MC and MC Child, bringing the usual verbal finesse and interplay. And we can’t forget the SDI debut of Lithuania’s Climax in the opening timeslot. A big night for sure! 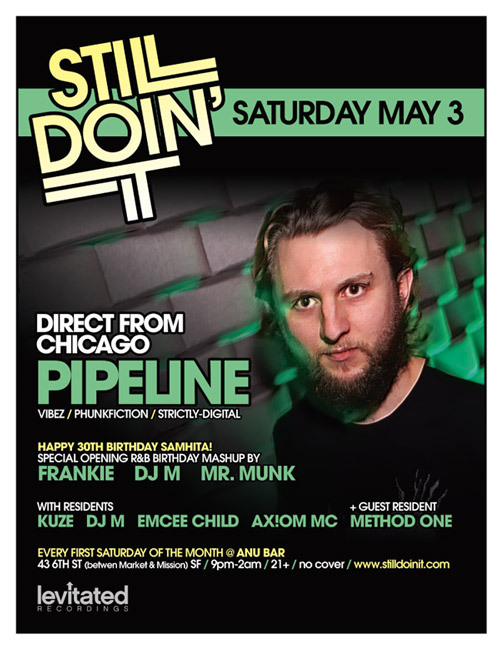 PIPELINE has been a staple on Chicago’s Drum & Bass scene for the past 10 years. As D&B buyer at Chicago’s legendary vinyl hub, Gramaphone Records from 2006-2008, he supplied the D&B masses with all the latest cuts. 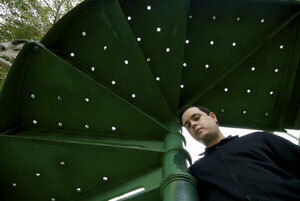 He is also a resident at the city’s longest running D&B weekly, The Seminar. He has recently thrown his hat into the production ring and you can find his latest collaborations with Stunna on both VIBEZ and PHUNKFICTION Recordings OUT NOW! 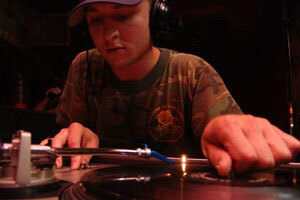 He has had a home on the virtual airwaves at www.Bassdrive.com since 2003. Catch his show every Tuesday night from 7-9pm CST. SDI print design by Secondmethod Design. SDI crew photo by Evesorange.